Like old-school film cameras that require a roll of negatives to expose images onto, digital cameras lack onboard storage and use removable flash memory cards to record and save the snapshots. Annoyingly, after purchasing a new camera you will notice most manufacturers don’t include a memory card in the box, which means shelling out a few more bills before you can even press the shutter button. 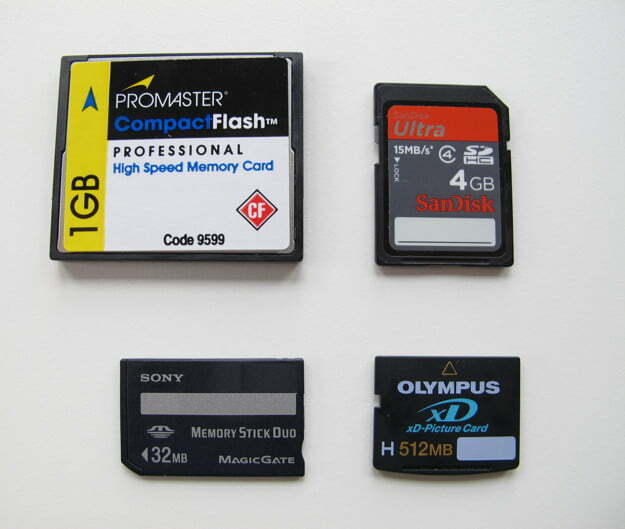 Not long ago, digital cameras utilized various competing formats of flash memory. As you may know, a flash memory card utilizes solid-state memory, as there are no spinning parts like a traditional hard drive. But not long ago, camera manufacturers decided to adopt a variety of competing formats, such as Secure Digital (SD), MultiMediaCard, xD-Picture Card, Memory Stick, and CompactFlash (CF). This created a format war akin to HD-DVD versus Blu-ray or VHS versus Beta. Although they all do the same thing, each had unique attributes and was not interchangeable. Ultimately consumers were on the losing end in this feud, forced to pick a side and be locked into a particular format. In recent years, however, two formats have emerged as victors: Secure Digital and, to a lesser extent, CompactFlash. Most new compact and midrange point-and-shoot cameras, as well as some entry- and mid-level DSLRs, support the postage stamp-size SD format. Some cameras also support multiple formats, like Sony’s with its proprietary Memory Stick, but most users should stick with SD since it’s easier to find and widely supported by other devices besides digital cameras. Professional-level DSLRs support CF cards, which are larger and thicker than SD, but have large capacities and fast transfer speeds. Because tech companies enjoy putting us through format hell, there are various versions within SD and CF, and what you choose to buy depends largely on whether your camera can support it. The bright side is that, for most users, the choice is SD and the cost is relatively minimal. If you already own a memory card that is compatible with a new camera you purchased, you could save money and reuse that card. But as new cameras get more advanced with every iteration, you may need a new card that can keep up with the features. That 128MB SD card you have from your ancient point-and-shoot, for example, won’t cut it for the large-file-size images DSLRs take, nor will it have the ample speed to handle high-definition video. So, how do you pick the right card? Before you make any purchase, find out what your camera supports. Most likely it will be in the SD family of formats if it’s a newer camera. SD comes in three flavors: the original plain-old SD, SD High Capacity (SDHC), and the newer SD eXtended Capacity (SDXC). Each version of SD comes in a variety of storage capacities and transfer speeds, and is priced accordingly. Unless your camera is older than five years, choose a SDHC card over regular SD. (Only until recently, companies like Sony, Olympus, and Fujifilm supported proprietary formats, but have since gone the SD route.) Keep in mind: older digital cameras that don’t support SDHC won’t read from or write to it, even though both SD and SDHC are physically similar in look and size. SDXC cards offer greater capacity and speed, are are ideal for advanced users who shoot a lot of 4K footage or shoot in uncompressed RAW. Also, the smaller Micro SD variant is used a some manufacturers, like Samsung and Nikon. However, most companies have stuck with standard-sized SD, although you can use a Micro SD card with these cameras by way of an adapter. This indicates that the card is in the SDHC format with a 4GB storage capacity and a Class 4 speed rating. 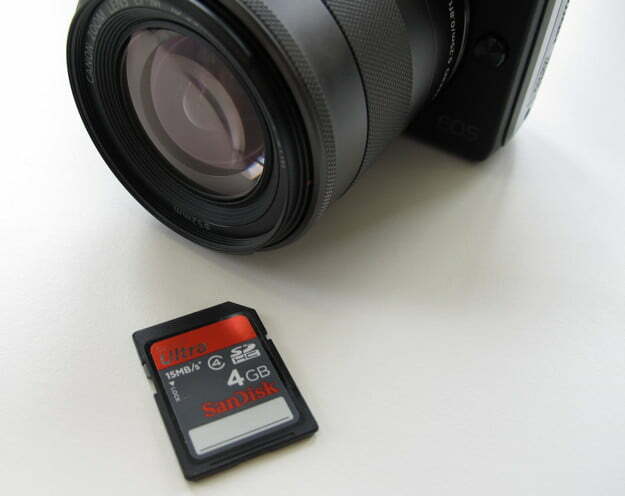 If you are a casual snapshooter, stick with a SDHC card with a Class 4 speed rating (the 4 signifies a minimum speed of 4MBps) and as much capacity as you can afford. If you take photos occasionally, a 4GB card should suffice, which will cost you less than $10. (You can also reuse an old SD card if you have some lying around, provided it has sufficient storage.) For those who shoot often, shoot at high resolutions, or are prone to never deleting images off the card, pick a card with more storage or buy several. Enthusiasts will want to step up to a SDHC card with larger capacity and faster speed. If photography is in your blood, and you use a high-end point-and-shoot or DSLR to shoot action shots or HD video, you fall into this category. A card with a slower speed rating could result in longer wait times while the camera is writing to the card. While a Class 4 card is fine for general use, get a Class 6 (6MBps minimum transfer speed) card with 16GB to 32GB or more if you plan on putting your camera to work. Class 10 SDHC and SDXC cards offer even greater speed, but you should decide if your photography needs and budget truly justify the cost. 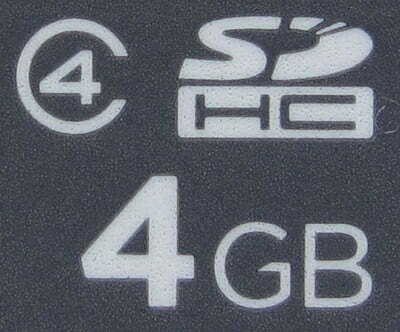 In high-end SDHC and SDXC cards, you may also notice the UHS-1 or UHS-I designation, which stands for Ultra High Speed. These are the fastest SDHC and SDXC cards you can buy, with transfer speeds of up to 104MBps. To take advantage of this speed, your camera must be able to support it, otherwise the card will operate at a lower speed. If you have a camera that takes CF cards, chances are you are a high-end DSLR-toting pro or semipro who already knows what you are doing. These durable cards not only have large capacities but also fast speeds, something pros require if they are frequently shooting uncompressed RAW images. CF comes in Type I and Type II, with the physical difference being in thickness. A camera like the Canon EOS-1D X supports both while the Nikon D4 accepts Type I, so check your camera’s specs. Like SD, the faster and larger the CF card, the higher the price. A new variant, known as CompastFast or CFast, offers higher transfer speeds than traditional CompactFlash, as the name suggests. -Check your camera’s specs to find out what memory card format it will support. Many cameras made within the past five years should support both SD and SDHC, but older cameras may not support SDHC. The newest cameras should also support SDXC, while professional DSLRs, such as those from Nikon and Canon, use the CF format. -Casual shooters can get by with a 4GB SDHC card, so purchase the one that fits your budget. The more storage you can get, the better. -Advanced users who do a bit more with their cameras, like fast-action photography or high-definition video, should look for a SDHC card with at least 16GB of storage and a Class 6 speed rating. If your budget allows, get more storage. Get a Class 10 or SDXC card only if you can afford it or if your needs demand it. -Although some brands may be more reliable that others, focus on the capacity and speed that fits your budget or needs. For casual use, we find that most cards can handle the job.